The Herdwick is the iconic breed of the Lake District. 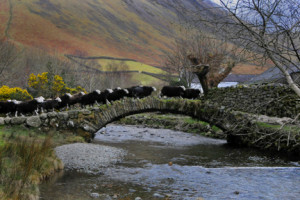 The association with Mrs Heelis “Beatrix Potter” are well known and her legacy to the Lake District through the National Trust was based on her recognition of the importance of the Herdwick to the landscape and farming. Fell-farming is one of the most sustainable agricultural systems in the UK today, in which the needs of the wild habitat and those of the domesticated animals are balanced and nurtured. Essentially, the environment of the high fells is maintained by the grazing of the sheep. We would like to encoura ge people interested in Herdwicks to come and stay in the Lake District on a Herdwick Farm where they can meet the sheep and the Shepherds.